↑ Beyer, Stephan V. (1992). The Classical Tibetan Language. SUNY Press. ISBN 0-7914-1099-4. ↑ Denwood, Philip (1999). Tibetan. John Benjamins Publishing. ISBN 90-272-3803-0. ↑ Denwood, Philip (2007). 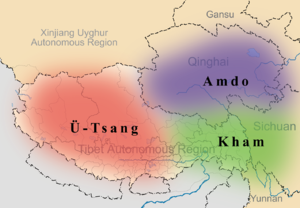 "The Language History of Tibetan". In Roland Bielmeier, Felix Haller. Linguistics of the Himalayas and beyond. Walter de Gruyter. pp. 47–70. ISBN 3-11-019828-2.